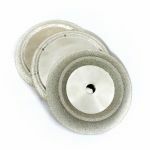 Diamond cutting blades feature exposed diamond particles embedded in a metal matrix. Each diamond has a small cutting edge. These blades may have a steel core or they may be made of diamond throughout the blade. High speed diamond cutting saws can reach surface speeds of 30 m/sec during operation. The cutting action happens as small chips scratched out by the diamond particles accumulate. 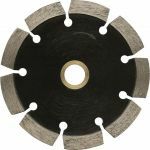 The number of cutting edges on the diamond cutting blade is determined by the number or concentration of the diamonds in the blade combined with the matrix of the blade. The thickness of the blade determines the width of the cut it will make. 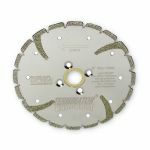 You will need to select the right diamond blade and combine it with the right feed rate, cutting speed and depth of cut to achieve the best diamond sawing success on your project. Alpha Libero Marble Blade - 5"